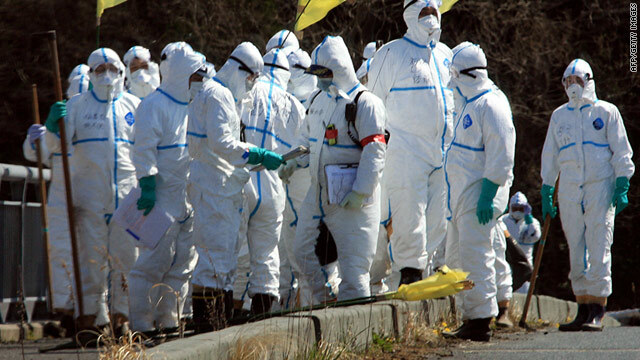 Police in radiation-proof suits on Sunday search for the missing in Namie, Japan, near the Fukushima Daiichi nuclear plant. Tokyo (CNN) -- The death toll from Japan's earthquake and tsunami rose to nearly 14,000 on Monday as efforts continued to stabilize a crippled nuclear reactor plant. Another 14,030 people are missing, according to Japan's National Police Agency. Police and soldiers still are combing the ruins of coastal villages in search of more bodies. The March 11 magnitude 9.0-earthquake and the tsunami it spawned have killed 13,843 and displaced more than 136,000 people, police said Monday. No deaths have been caused by the incident at the nuclear plant, though Japanese authorities have ordered people who live near the plant to evacuate because of the danger posed by radioactive particles that have been emitted from the plant. On Monday, safety officials said that remote-controlled robots and the workers controlling them have recorded high levels of radiation inside and around two reactor buildings at the Fukushima Daiichi nuclear power plant in northern Japan. The tsunami damaged the plant's cooling systems unnerving hundreds of thousands of people. The U.S.-built robot probes measured radiation doses as high as 57 millisieverts inside the housing for reactor No. 3 and up to 49 millisieverts inside the No. 1 reactor building, Japan's Nuclear and Industrial Safety Agency reported. Levels found between the double doors of the airlocks of the reactor buildings were much higher -- 270 millisieverts in the case of reactor No. 1 and 170 millsieverts in No. 3, the agency said. By comparison, the average resident of an industrialized country receives a dose of about 3 millisieverts per year. Emergency standards for plant workers battling the month-old nuclear disaster limit their annual exposure to 250 millisieverts, while a CT scan produces just under 7 and a chest X-ray delivers a one-time dose of about .05 millisieverts. Doses above 100 millisieverts can increase the long-term risk of cancer, while 1,000 millisieverts can produce radiation sickness. 9 months to shut down Japan's reactors? There was no immediate explanation for the much-higher radiation levels recorded in the airlocks, said Hidehiko Nishiyama, the safety agency's chief spokesman. The robots were inserted Sunday in an attempt to determine the conditions inside the No. 1 and 3 reactor buildings, which were blown apart in massive hydrogen explosions in the first days of the worst nuclear accident since Chernobyl. The cooling systems for Fukushima Daiichi reactors 1-3 were knocked out by the March 11 tsunami that struck northern Japan, causing the reactor cores to overheat, spewing huge amounts of radioactive contamination across the surrounding area. Nishiyama said running the "Packbots" in reactor No. 3 was difficult because of the amount of debris scattered around the building, but engineers found the building was dry and the temperatures were normal. In unit 1, the robot found a high level of humidity, the explanation for which was not known Monday night. The robots were inserted the same day that the plant's owner, the Tokyo Electric Power Company, announced a six- to nine-month plan to restore normal cooling systems and shut down the damaged reactors at Fukushima Daiichi. Japan's government has designated the situation a top-scale nuclear disaster. Nishiyama said he did not know whether the data recorded Sunday would affect the timetable laid out by Tokyo Electric, which had been under pressure to lay out a timetable to resolve the crisis. No data has yet been reported from the No. 2 reactor, which is believed to be leaking an undetermined portion of the 6-7 cubic meters (1,600-1,800 gallons) of fresh water being pumped into it every day. The plan laid out Sunday would bring an end to that improvised solution, which has left workers scrambling to find places to contain the vast amounts of contaminated water that have flooded the basements of the units. In Tokyo, meanwhile, Japan's government took a step toward slowing what critics have called a revolving door between the nuclear industry and the ministry that regulates it. Chief Cabinet Secretary Yukio Edano said the government is urging officials of the Ministry of the Economy, Trade and Industry to stop taking jobs with companies that run nuclear plants upon retirement. "I have consulted with METI and decided to request that government officials to voluntarily refrain from seeking re-employment at electricity companies, and asked electricity companies for their cooperation," Edano told reporters. But he said the ruling Democratic Party of Japan lacks the votes in parliament to make his call a law at this point. Critics say the practice -- known in Japanese as amakudari, or "descent from heaven" -- creates cozy ties between the government and the nuclear industry at the expense of the public interest. Edano's declaration was "a necessary step but it's not enough," said Tetsunari Iida, a former nuclear engineer who now runs an alternative energy think-tank. Tokyo Electric is one of the companies that has come under fire for the practice. Company spokesman Hiro Hasegawa told CNN that the company tries to keep some "distance" between itself and the government, but added, "The nuclear industry is a group of specialists. We cannot deny there is close communication." And Eisaku Sato, a former governor of Fukushima Prefecture and a longtime critic of Japan's largest utility, said the nuclear safety agency should be independent and the government needs "to create a sense of safety built on trust." "This is a test of Japanese democracy," said Sato, who has been battling corruption charges he says are retribution for his criticism of the industry. "We must make a flawless framework for operating Japan's nuclear power plants, one that the people of the world can feel safe about." Sato told reporters Monday that Tokyo Electric missed a warning signal at the plant less than a year ago. He said emergency generators failed to start when a power failure in June 2010 cut off cooling systems at reactor No. 2, forcing workers to start the diesel-powered backups manually. Hasegawa disputed that account, telling CNN that emergency generators kicked in automatically and the reactor shut down. Water levels dropped in the reactor for a brief period, forcing the company to declare the incident to the government, but he said no radiation was released. An investigation later determined that power was cut off by accident when workers for a subcontractor were installing temperature gauges in a cramped space. No disciplinary actions were taken against anyone at the plant, Hasegawa said. Hiroo Saso, Susan Olson, Yasuko Nakaba and Yayoi Sogo contributed to this report for CNN.